A few weeks ago I wrote a blog saying that developers learn new languages because they're cool. I still stand by this assertion because the thing about Java 8 is it's really cool. Whilst the undoubted star of the show is the addition of Lambdas and the promotion of functions to first class variables, my current favourite is default methods. This is because they're such a neat way of adding new functionality to existing interfaces without breaking old code. The implementation is simple: take an interface, add a concrete method and attach the keyword default as a modifier. The result is that suddenly all existing implementations of your interface can use this code. In this first, simple example, I’ve added default method that returns the version number of an interface1. You can then call this method on any implementing class. I’ve recently been following the #isTDDDead debate between Kent Beck (@kentbeck), David Heinemeier Hansson (@dhh), and Martin Fowler (@martinfowler) with some interest. I think that it’s particularly beneficial that ideas, which are often taken for granted, can be challenged in a constructive manner. That way you can figure out if they stand up to scrutiny or fall down flat on their faces. Fast Unit Tests, complete in the blink of an eye. He went on to say that you therefore drive your system’s architecture from the use of mocks and in that way the architecture suffers damage from the drive to isolate and mock everything, whilst the mandatory enforcement of the 'red, green, refactor’ cycle is too prescriptive. He also stated that a lot of people mistake that you can’t have confidence in your code and you can’t deliver incremental functionality with tests unless you go through this mandated, well paved road of TDD. 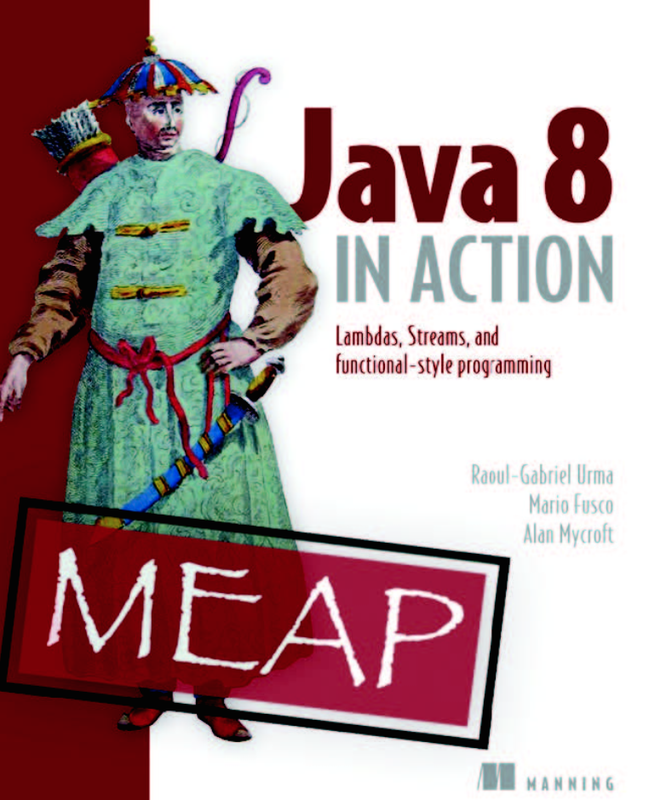 Is it Imperative that you learn Functional Programming with Java 8? 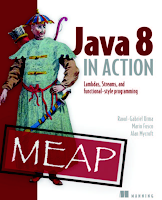 I've recently been taking look at Java 8 and have got hold of "Java 8 In Action" published by Manning. The first thing that struck me is how one of Java 8's unique sales propositions is functional programming; functions are now first class variables, you can pass them around your code as you would an int or a String. This is a big change. If you’ve read the previous five blogs in this series, you’ll know that I’ve been building a Spring application that runs periodically to check a whole bunch of error logs for exceptions and then email you the results. This blog takes a look at meeting requirement number 8: "The whole thing will run at a given time every day" and this means implementing some kind of scheduling. If you've read any of the previous blogs in this series, you may remember that I'm developing a small but almost industrial strength application that searches log files for exceptions. You may also remember that I now have a class that can contain a whole bunch of results that will need sending to any one whose interested. This will be done by implementing my simple Publisher interface shown below. 7 . Publish the report using email or some other technique. 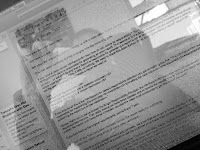 In this blog I’m dealing with the concrete part of the requirement: sending a report by email. This is the third blog in a series that's loosely looking at tracking application errors. In this series I’m writing a lightweight, but industrial strength, application that periodically scans application log files, looking for errors and, if any are found, generates and publishes a report. If you’ve read the first blog in the series you may remember that I initially said that I needed a Report class and that “if you look at the code, you won’t find a class named Report, it was renamed Results and refactored to create a Formatter interface, the TextFormatter and HtmlFormatter classes together with the Publisher interface and EmailPublisher class”. This blog covers the design process, highlighting the reasoning behind the refactoring and how I arrived at the final implementation. In my last blog, I started to talk about the need to figure out whether or not your application is misbehaving in it's production environment. I said that one method of monitoring your application is by checking its log files for exceptions and taking appropriate action if one is found. Obviously, log files can take up hundreds of megabytes of disk space and it's impractical and really boring to monitor them by hand. I also said that there were several ways of automatically monitoring log files and proposed a Spring based utility that combs log files daily and sends you an email if / when it finds any exceptions. I only got as far as describing the first class: the FileLocator, which will search a directory and it's sub-directories for log files. 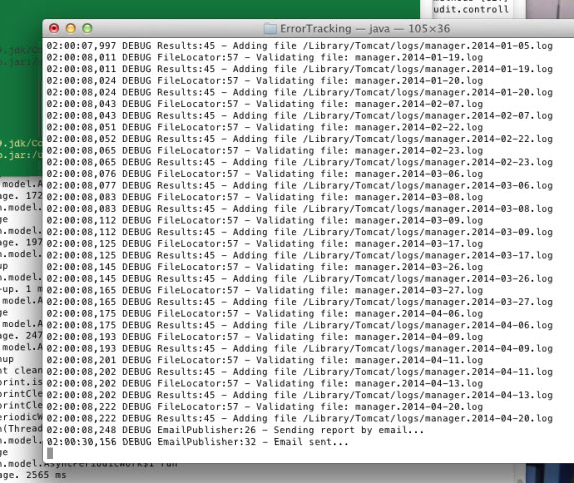 When it finds one, it passes it to the FileValidator.